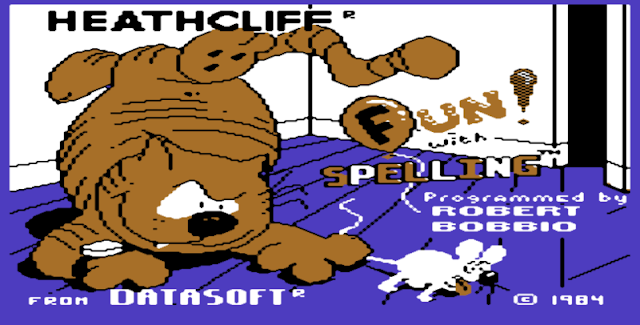 In 1984 Datasoft and developed by Robert Bobbio released the child friendly game of ' Heathcliff - Fun with Spelling ' for the C64. It was an educational game for kids and based on the brilliant cartoon show of the same name. The aim of the game was to catch the mice that float from the window sill using balloons that have the correct letters to spell the word at the top of the game. So if FUN was missing a U, you'd have to catch the U floating mouse. But be careful one wrong mousy and it's a big oops! Thanks to Hokuto Force, they've released the game again but this time with enhancements like bug fixes, graphics and an option to make it more challenging for adults! Although this is not my type of game, I can certainly see the appeal for families with young kids. This is the sort of game to bring everyone together and for a new generation to experience a far easier and more friendly side of the C64. But if you don't have kids, try out the new challenging adult mode and listen to the rather upbeat and chippy soundtrack!